Come writers and critics / who prophesize with your pen / and keep your eyes wide / the chance won’t come again…. 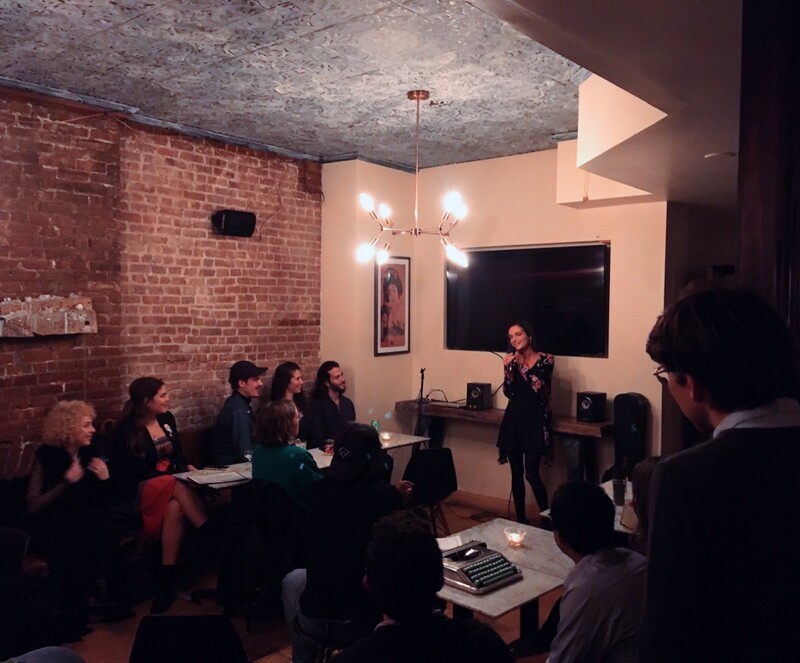 Prophets of pen, voice, guitar, and typewriter filled Bar Uni on Tuesday night for the second monthly installment of Você, an event made to bring together voices across backgrounds and disciplines. 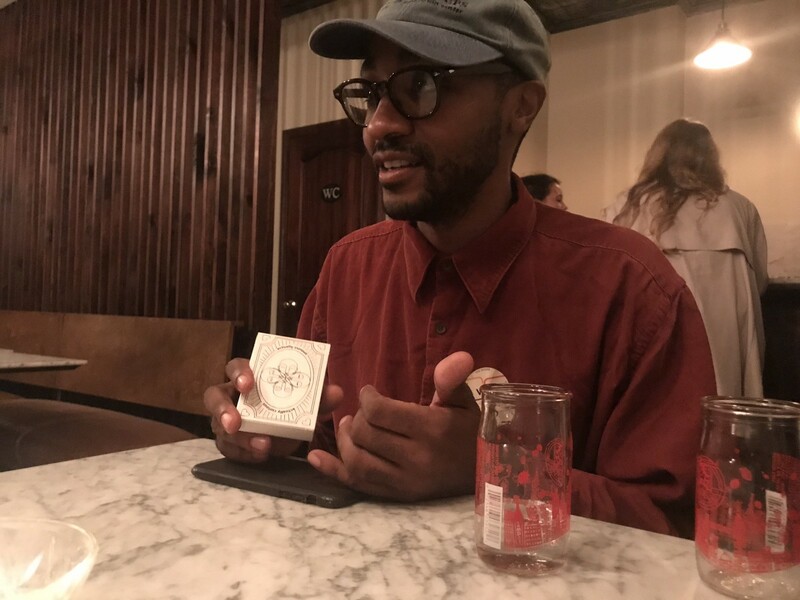 The evening warmed up with a test drive of Curiosity Lab’s illuminating card game, Actually Curious, in which players ask each other questions ranked from blue (quirky icebreakers) to red (questions that would be difficult to ask your best friend or lover). True to its name, the game actually made people curious, and strangers quickly opened up about themselves on why they would choose eternal youth over time travel, their closest-held cultural value, and the last time they cried. This month’s Election Night feature was a senator who did heed the call — newly elected State Senator Julia Salazar, of New York’s 18th district. I was amazed to see a politician who was truly just a person, someone I could have spoken with at a community meeting in any city. 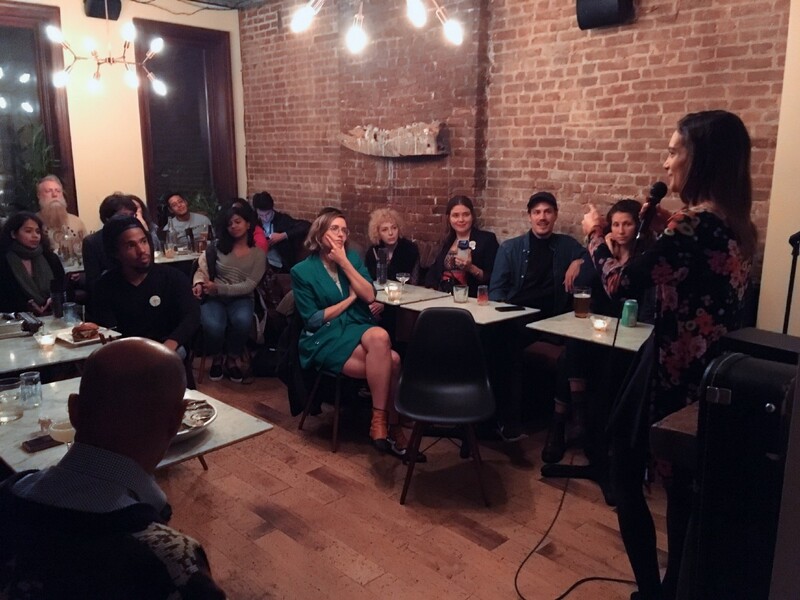 Salazar spoke of her time organizing with the DSA (Democratic Socialists of America), her dedication to correcting New York’s housing crisis, and her belief that everyone with a passion for justice should consider running for public office, even (and especially) if it seems like something they would never do. Even as a poet with a liberal arts education and potentially incriminating social media presence, I myself felt inspired when Salazar answered an audience member’s question about potential hurdles toward running by recounting her own history of civil disobedience-related arrests. Even after Salazar left for the next stop on her election night city tour, I could feel how charged the room was by her words and presence. This exuberance carried on in the music of Courtney McKenna, whose vocal stylings invoked a 1960s folk revival spirit that perfectly paralleled the night’s themes of political upheaval and unity of the people. She played a few originals, as well as a cover of Bob Dylan’s “The Times They Are A-Changin’” that highlighted the song’s lasting relevance — especially where we are right now. The next guest was Danish economist Esben Baek, who spoke about wage labor, where it rests in the history of slavery and feudalism, and distortion of the Western conception of profit — particularly in the US, where wages have completely stagnated in relation to the growth of profit margins over decades. 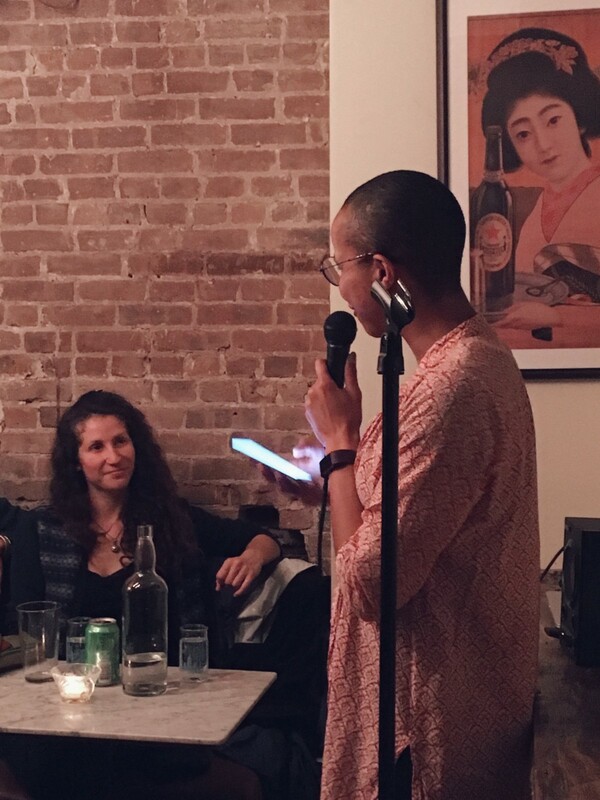 The evening’s poet-in-residence, Michele Hatchette, reminded us all of the driving force that keeps us fighting the good fight — love. Her warm and heartfelt words put the personal back in the political, and kept the audience’s spirits high as the night brought us closer and closer to election results. 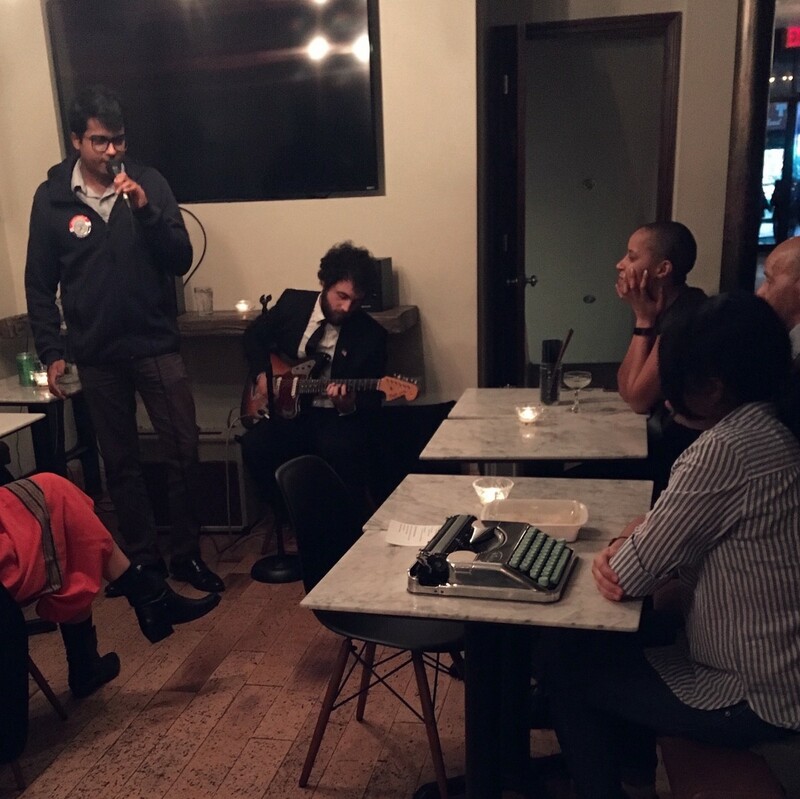 Closing out the performances, before turning on the big-screen TV and watching the votes roll in, was a collaboration between musician Andrew Milea and poet Karthik Purushothaman. 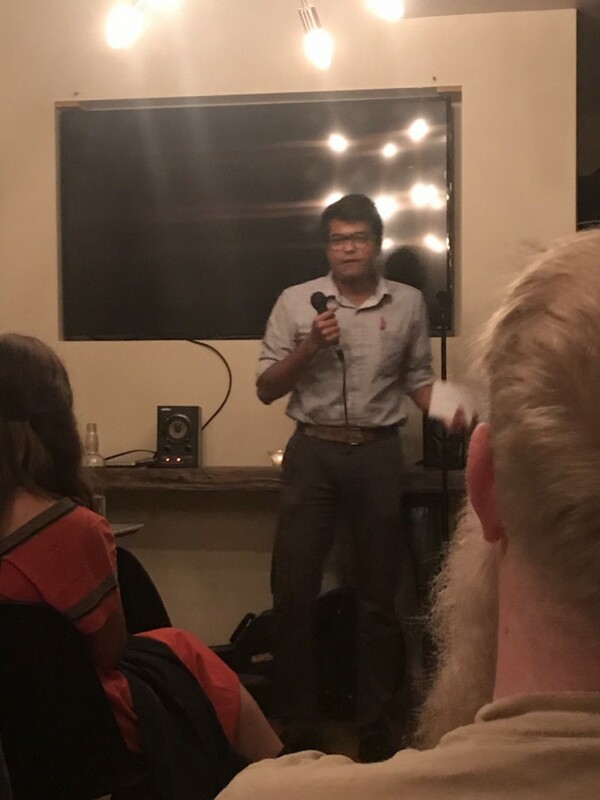 Purushothaman’s spoken word piece “Nazi Driver,” backed by guitar, led seamlessly into Milea’s “Genius” — two searing takedowns on Trump’s cultish effect on American culture. When all was said, played, and sung, the room felt charged with both optimism and defiance — ready to take on whatever the news had to throw our direction. Join LA, Karthik, and more guests at the next installment of VOCÊ on December 5th at Bar Uni. Article by Elliott Case. Elliott is a Californian poet based in NYC and can be found at elliottskycase.com.